What is a graphical picture frame? AWC allows you to use an image as a picture frame for the pictures you display on your desktop. As with a physical picture frame the image you use needs to have a decorative outline or border and a transparent area in which to display your picture. There are two main image formats which support transparency: GIF (Graphic Interchange Format) and PNG (Portable Network Graphics). In the example on the right the picture frame is a PNG image named PaintedPixels_floral gold2.png which is one of many frames available for free from the Painted Pixels web site. But, if you are of an artistic bent, you can easily create your own using any painting tool that supports transparent image formats. How do I configure AWC to use my picture frame? 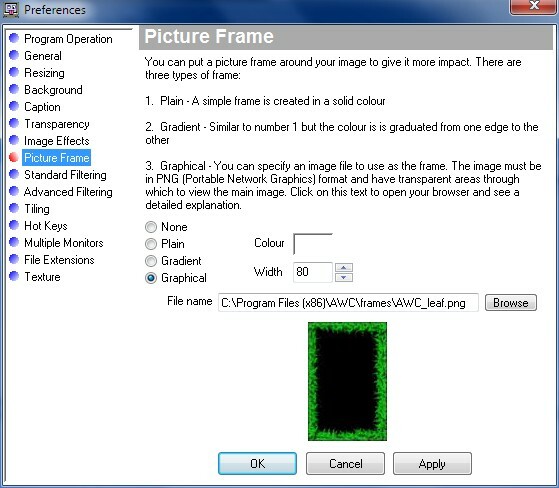 The picture frame settings can be found on the Image Processing tab of the Preferences screen. The most important one is, of course, the one you use to define the image you want to use as a frame. To do this just select the radio button labeledGraphical and then click the Browse button to open a file dialog that allows you to pick the file you want. The dialog will only list files that are of GIF and PNG format as they are the only ones which support transparency. 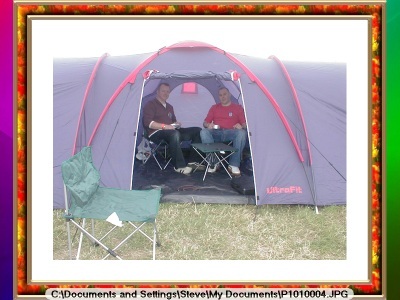 If you apply the changes now the image displayed on your desktop will have the picture frame painted over it. If the opaque borders of you frame are narrow this is often sufficient to get the effect you want. If your frame has wider borders though, you may find that they are covering more of your base image than you would like. To get around this issue you can shrink your base image down and apply a plain border and then put that inside your frame instead. To do that just select a colour and width (in pixels) for the border. In the example above the border is 80 pixels wide and white giving a nice, professionally framed, look to the final image. A short video demonstration is below.